Updated: Dec. 7, 2016 at 11:02 p.m.
PHILADELPHIA — Coming off its worst game of the season, shooting just 22.6 percent in a 19-point loss to Florida State, men’s basketball hoped to rebound with a trip to Temple Wednesday night. The Owls (6-3) entered the contest riding a five-game winning streak, garnered three votes in last week’s AP top-25 poll and had just defeated FSU two weeks prior. 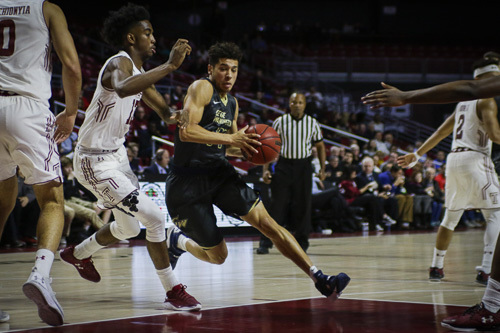 GW (6-4) did not shy away from its formidable American Athletic Conference opponent, but instead shot a season-high 47.2 percent from the floor to earn a hard-fought, 66–63 road win behind a tenacious team effort. The bounceback effort was not without another dramatic ending. Graduate student forward Tyler Cavanaugh knocked down a corner-three off a pass from sophomore guard Jordan Roland with only 7.8 seconds to play and one second left on the shot clock to break the tie and clinch the three-point win. Cavanaugh led GW in scoring on the night with 20 points and 4 assists. Roland also had a stellar night, hitting 6 of his 9 shots from the field and finishing with a career-high 14 points. Playing the majority of the game with three forwards on the floor, the Colonials dominated the battle on the glass, collecting 37 boards compared to 23 for the Owls. Freshman big men Arnaldo Toro (9r) and Collin Smith (7r) led the way combining for 18 rebounds on the night. 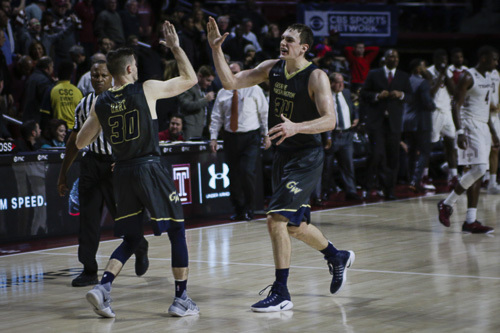 The Colonials were also able to work the ball around the floor against Temple’s defense efficiently, collecting a season-high 18 assists on the night. Redshirt junior point guard Jaren Sina led the team with six assists. The game was tight right from the opening minute. The two teams traded baskets before three-pointers from Cavanaugh and Sina gave the Colonials a seven-point lead six and a half minutes into the action. GW held onto that lead for the remainder of the half, answering on offense each time the Owls were able to find a rhythm. A three from Roland and three points the old-fashioned way from Cavanaugh allowed the Colonials to extend the GW lead to 31–25 at halftime. 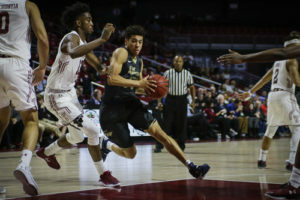 GW kicked off the second half with a 10-3 run in the first four minutes of the frame, grabbing its first double-digit advantage of the game and remaining in control. The Colonials held on to that lead for the majority of the game behind an improved effort defensively. The Owls shot a solid 42.6 percent during the game, but were unable to compile many runs for most of the second half. They finished with a total of only five offensive rebounds, limiting their second chance opportunities. Trailing by nine with less than four minutes left, Temple still did not give up. Back-to-back three-pointers from redshirt senior guard Daniel Dingle with less than two minutes to play tied the game at 61 and sent the home crowd into a frenzy. After Cavanaugh’s game-winning shot the Owls were able to get off a final three-point attempt with a chance to tie the game up. The shot missed as the clock hit zero. The Colonials will return home on Saturday to host Howard (1-5) at the Smith Center. Tip off is scheduled for 4 p.m. Junior guard Yuta Watanabe and graduate student Patrick Steeves, both injured, did not travel with the team Wednesday. The timetable for both players remains unclear.